Now you have all the room in the world to store your music, movies and everything else. 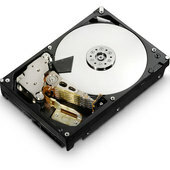 Hitachi today was the first company to bring out a 3TB hard drive that spins at 7,200 RPM. The drive called Deskstar improved its spinning speeds making it one of the fastest drives. The Deskstar 7K3000 offers more than just rotational speeds, the drive also makes Hitachi the first manufacturer to have a 6Gbps SATA interface. The Deskstar is a five-platter design which Hitachi has been inclined to recently. The idle power draw is rated at 6.8W which increases under load. Western Digital was sporting its 3TB hard drive which had a spin speed of 5,400 RPM but looks like consumer demand has drive Hitachi for higher speeds and data throughput. The Deskstar 7k3000 is expected to be priced at around $400. Fastest Wi-Fi to come to your home soon but are ISP’s ready? Next $1.6 Billion Worth Christmas Technology Presents to be Dumped in 2010!